Illinois' Aleks Vukic volleys against Kentucky on Friday, Feb. 26 at the Atkins Tennis Center. No. 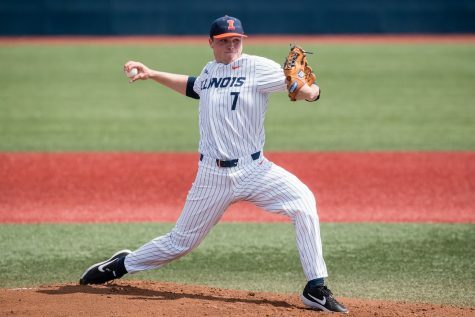 19 Illinois blanked Northern Illinois University 4-0 Friday afternoon, but fell to No. 21 Kentucky later in the evening at Atkins Tennis Center. 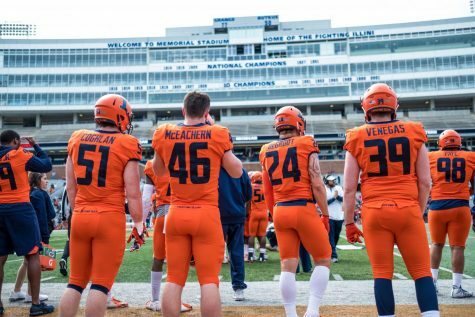 The Illini are now 6-4 on the season. 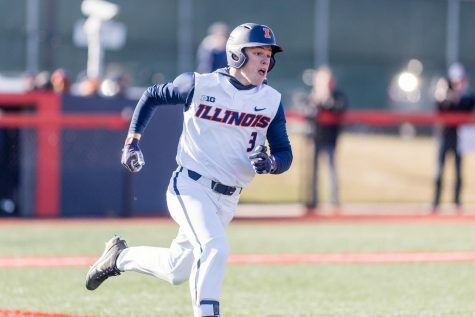 The doubleheader began with NIU, where the Illini saw improvements in doubles right away. Juniors Aron Hiltzik and Aleks Vukic defeated Eric Marbach and Georg Lundkvist. On the next court, redshirt senior Alex Jesse and freshman Aleks Kovacevic followed the lead by securing a victory against Louis-Philippe Hamel and Tom Hjertonsson. 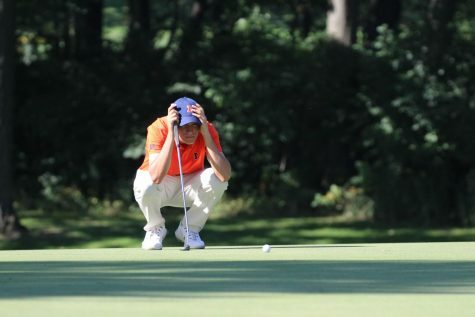 Illinois breezed through singles play. 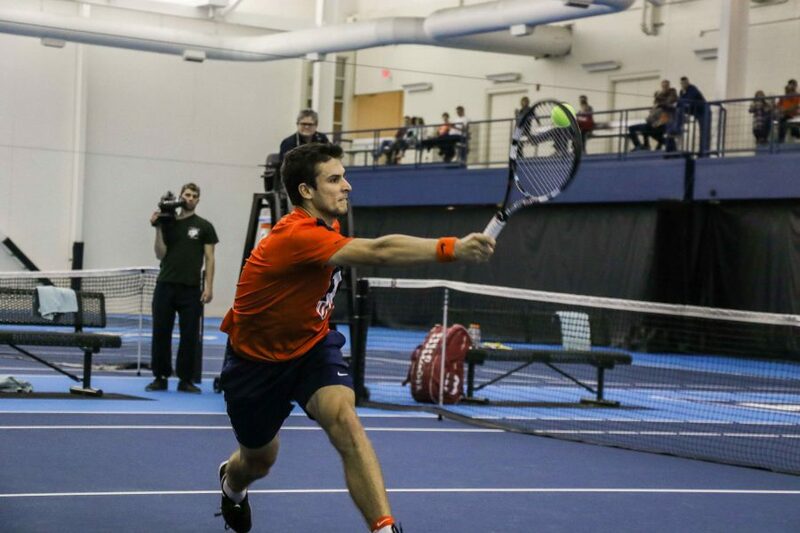 Freshmen Vuk Budic and Noe Khlif clinched straight sets to move the Illini to 3-0 against the Huskies. 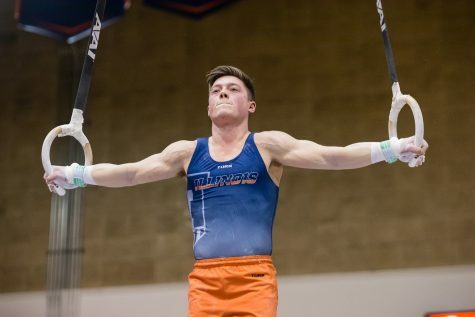 Senior Julian Childers found himself collecting the Illinois win for the third time this season. He played Marbach in the No. 1 singles position. 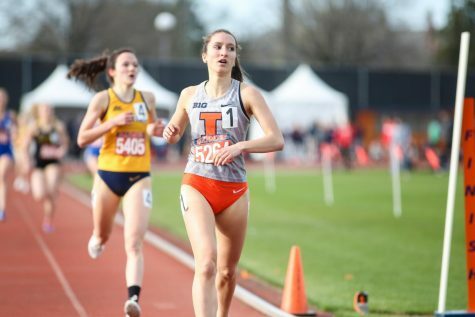 A few hours after the Illini’s victory, the team fell 4-0 to Kentucky. The evening began with Hiltzik and Vukic crushing the pair of Beck Pennington and Enzo Wallart 6-2. However, a winning mentality did not last long, according to head coach Brad Dancer. The Illini lost their first doubles point to Kentucky due to crowd penalties during the match. This changed the atmosphere at Atkins, Dancer said. 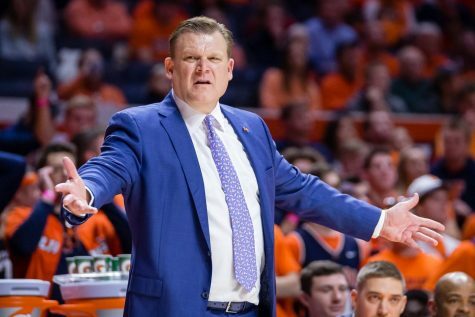 The Wildcats clinched two more points against the Illini. Freshmen Zeke Clark and Gui Gomes were defeated by Ryotaro Matsumura and Trey Yates while UK’s William Bushamuka and Nils Ellefsen beat Jesse and Kovacevic on the next court. In singles, the Wildcats swept the Illini. Childers was defeated by Pennington and Ellefsen won over Gomes. Yates collected the win for the Wildcats in a victory over Khlif. 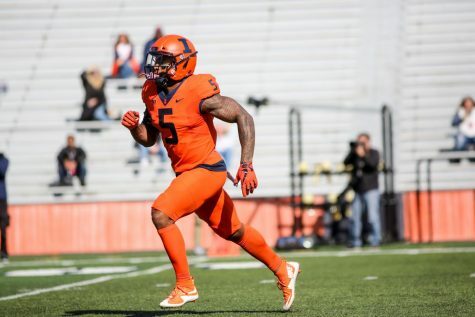 Up next, Illinois take on Ball State and its second Big Ten opponent, Purdue, in West Lafayette, Indiana, on Wednesday. 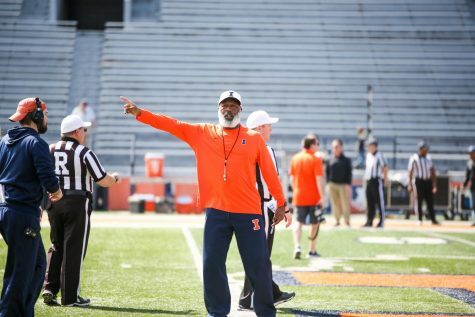 The Illini play at 11 a.m. and 5 p.m., respectively.